Absolon, owner of the 60-footer, Spirit of the Maid, plans to marry his fiancée, Gail Bird, on the lay-day during the regatta, which will be staged from August 17 to 24. He has gone to great lengths to ensure it will be a spectacular and memorable event, one where the bride will arrive by helicopter for the ceremony on a deserted beach, and guests will later celebrate the nuptials aboard a 32-metre motor yacht. Now, all he has to do is make sure nothing goes awry from his side of things. Even so, there would probably be some small level of understanding by the bride-to-be as she is a regular member of Spirit of the Maid’s crew. 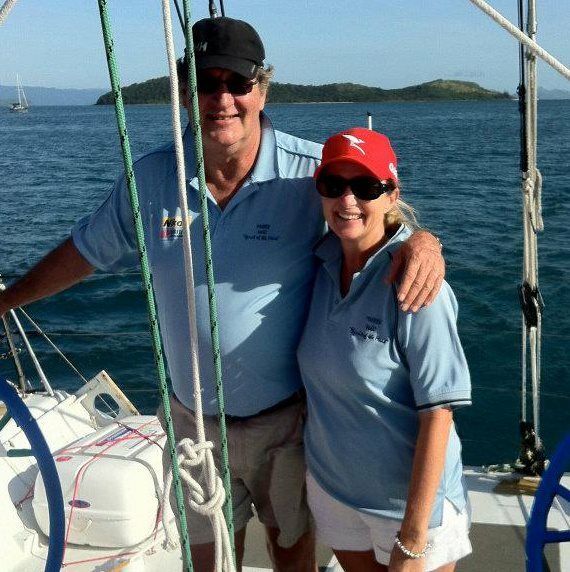 Gail and Bruce’s relationship has evolved around sailing, Hamilton Island and Audi Hamilton Island Race Week. Bruce is the Development Manager at the island, while Gail is the Administration Manager at Hamilton Island Air. They met at Southport Yacht Club, on the Gold Coast, when Bruce was there with the yacht two years ago, and soon after that Gail was aboard Spirit of the Maid for all the big events, including the Brisbane to Gladstone race and Race Week. 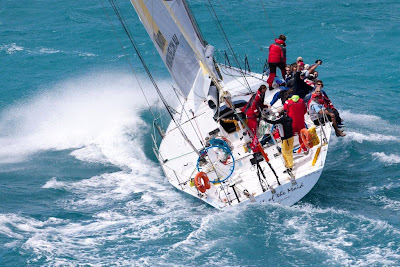 Gail was part of the team aboard Spirit of the Maid for last year’s Audi Hamilton Island Race Week when America’s Cup legend, John Bertrand, was at the helm for the series. It was after one of the races, when everyone was sitting around in the cockpit enjoying a drink back at the dock, that Bruce decided the time had come: he popped the question and Gail replied ‘yes’ to the sounds of cheering and applause. The newlywed Mr and Mrs Absolon might also have every right to be concerned about Spirit of the Maid’s participation in Race Week’s Prix d’Elegance fun event on Friday, August 23. There is already a rumour that the crew plan to ‘Dress Ship’ in a very ‘wedding-ish’ theme. Entries for this year’s much-anticipated 30th edition of Audi Hamilton Island Race Week continue to be lodged at a record rate. The 70th entry is expected this week. 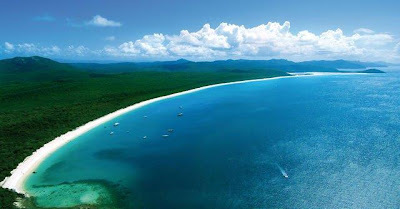 Luxury carmaker, Audi, returns as the Title Sponsor of Hamilton Island Race Week in 2013. The German premium brand will host a range of special events on the island for yacht owners and guests to enjoy during the week.